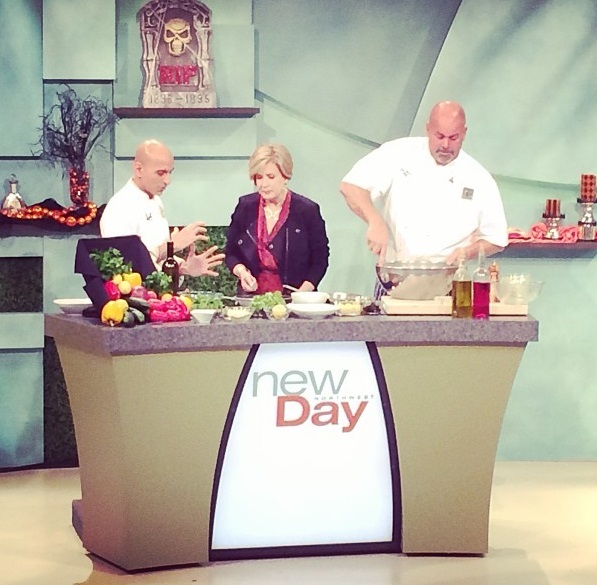 Upon arrival, the NFCA team headed to KING-TV to participate on the New Day show, alongside one of Seattle’s partner chefs, John Howie. During the segment, Chef Ambassador Jehangir Mehta created a special gluten-free dish, featuring halibut from Washington, as well as lentils and chickpea flour to showcase alternative gluten-free ingredients. Chef Howie created a delicious quinoa salad, featuring fresh vegetables and olive oil, a perfect accompaniment to Chef Mehta’s dish. The show’s host, Margaret Lawson, asked questions about the tour, proper gluten-free protocols and how chefs can get involved with GREAT Trainings. Besides becoming educated through the GREAT Kitchens training program, Chef Mehta spoke on the segment about a call for gluten-free recipes to be featured in an upcoming cookbook. For restaurants interested in submitting a recipe, they can be submitted at www.GREATChefsChallenge.com. Want to watch the segment? Check out Chef Mehta on the New Day Show at this link. GREAT job by Chef Mehta and Chef Howie on the New Day Show!